China has a new ally in its raging battle with the fog and smog lingering over Beijing - an unmanned drone spraying chemicals above the city. The Chinese government, with help from state-owned firm Aviation Industry Corp of China (AVIC), successfully tested the unmanned vehicles over the weekend at an airport in central China's Hubei province. 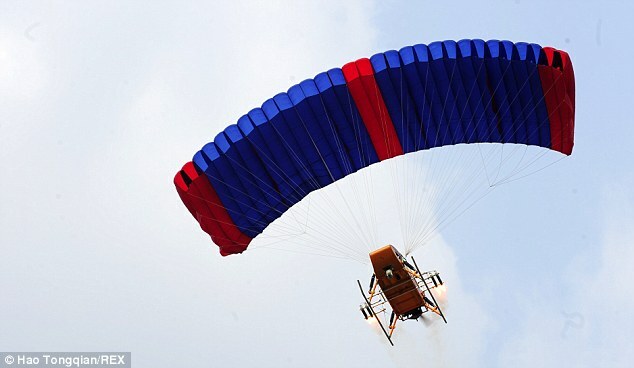 Called the Parafoil plane, the device is fitted to a gliding parachute and can carry 700kg of smog-clearing chemicals that can be used within a 5km radius - three times the cargo weight of common planes. The Chinese government, with help from state-owned firm Aviation Industry Corp of China (AVIC), successfully tested its Parafoil unmanned plane, pictured, over the weekend at an airport in central China's Hubei province. The plane has been designed to disperse smog above China's cities. The soft-wing unmanned aerial vehicle (UAV) is also said to cost 90 per cent less than fixed-wing drones currently used to clear the smog.